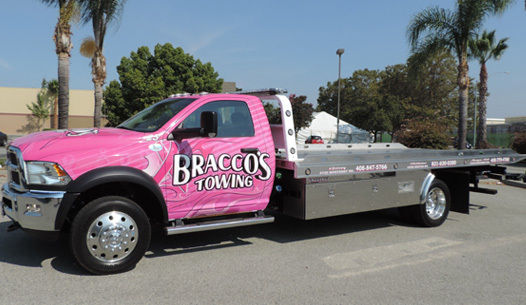 Bracco’s Towing and Transport Inc. is here for all of your light vehicle towing and recovery needs — 24 hours a day — seven days a week. We also provide vehicle unlocks, jumpstarts, tire changes, fuel delivery and more. If you need a tow, we have four-door, “family friendly” tow trucks to transport your vehicle, driver and passengers to their destinations. Our modern towing equipment includes flatbed and wheel-lift units that tow your vehicle safely and damage-free while easily handling recovery situations such as stuck in mud or ditch, rollovers, etc. And our professional, uniformed drivers are qualified, courteous and ready to respond to your needs. When you have a fleet vehicle that is disabled or involved in an accident, you want the peace of mind that your vehicle, driver and cargo will be treated with the utmost care as quickly as possible. 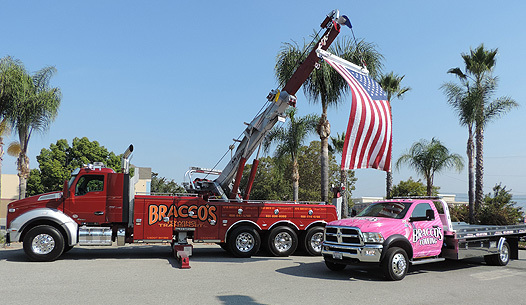 As our customers know, you can depend on Bracco’s Towing and Transport Inc. to get the job done with the right equipment. We routinely tow and recover service fleets, tractor-trailers, buses, motor coaches, RVs, dump trucks, cement trucks — any commercial vehicle. Whether it’s a tractor-trailer stuck in a ditch or an upside-down tanker, we have the most modern heavy recovery equipment available such as our state-of-the-art rotator. Our knowledgeable equipment operators are trained by the nationally known organization WreckMaster and certified by the California Tow Truck Association. Bracco’s Towing and Transport Inc. has live (no answering machine), bilingual, 24-hour dispatching as well as GPS tracking units in each of our trucks to get the right truck to you as quickly and efficiently as possible. Should you need repair assistance, we have resources and networks available to get your vehicle to the right dealership or repair facility. We also provide cargo-related services such as load shifts and cargo transfers. Bracco’s Towing and Transport Inc. can safely and securely store your vehicles and cargo in our fenced, lighted storage facility featuring 24-hour physical security monitoring. We have ample space for tractor-trailer combinations, and can store vehicle and cargo for as long as you need. It’s safe with us.